We are pleased to announce that Cynder, the Chaotic Dachshund will be our Guest Doxie for Wienerfest 2016. 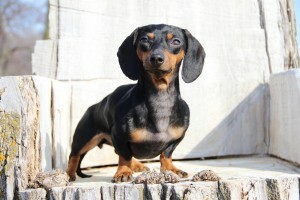 Cynder is a three-year-old Miniature Dachshund who loves showing off her agility skills and fun tricks! She currently knows over 100 behaviors and tricks including throwing out the trash, ricocheting from her owner’s hip, and skateboarding down ramps. She’s fearless and always on the go. She has a lot of personality and not afraid to show it! Cynder is from the city of Niagara Falls, New York, USA and has done trick and agility shows all over western NY, and the Ontario Canada area. Most notably she was the opening act for the Ultimutts Dog Show in October 2015 at Purina-PawsWay in Toronto, Ontario, CA. She enjoys having fun with her mom at shows, so if you’d like to have her as part of your show, please contact Cynder’s mom at DoxieCollie6@gmail.com or 716.382.8561. Please join us in welcoming Cynder at our event. And be sure to see her in action!